Civil and adroit are good terms for key attributes of successful folklore protagonists. Though the words may sound quaint to us now, the traits they describe are as relevant to our own world as they are to travelers in Faerie. Some of the Grimm Brothers’ stories seem to locate these attributes along gender lines, implying a world of civil females and adroit males. But if we review a number of tales, much of the time we find both characteristic needed by men and women alike. Girls who are rude or mean may wind up dead or have their eyes pecked out like Cinderella’s step sisters. Toads may jump from their mouths when they try to speak. Feminists point to such story features as efforts to domesticate young women and make them docile. Yet for many youngest sons, success also hinges on civility, often to seemingly insignificant creatures. It’s a dwarf who offers council in The Water of Life. When the worldly-wise older brothers mouth off to the little man, they end up imprisoned in stone. The youngest brother, who is respectful and heeds (most of) the dwarf’s advice, wins his heart’s desire and more. In many of these stories, motives are greater than simple expediency. The hero of The White Snake shows genuine compassion. Through a bit of (adroit) trickery, a king’s servant gains the power to understand the speech of animals. He goes traveling and saves three different kinds of “lowly” creatures – fish, ants, and baby ravens. Kind heartedness rather than self-interest drives him, for though the creatures promise to help him, they only do so after he sets them free. There were no strings attached to his generosity. The dictionary defines adroit as “skillful in a physical or mental way; clever; expert.” In fairy tales, this sometimes means knowing when to kill your horse to feed the ravens. At other times, it means cunning, trickery, and lies. In stories, we often imagine these as men’s attributes, perhaps because traditional full time tricksters, from Hermes to Coyote, are usually male. Yet in Grimm’s stories, young women need to understand and master deceit as often as men. In Bluebeard-type tales, and notably a frightening story called “Fitcher’s Bird,” it’s a matter of life and death. Part of being adroit is the intuitive sense of when someone or something feels wrong; when civility is not in order. In fairy tales, women often do this better than men. Typically, in three-brother stories, the youngest prince will trust his older brothers, even after the dwarf has warned him not to. Cinderella and girls like her know better than to be fooled by older siblings. Instinctively knowing when something is off has new relevance in the 21st century. Interviews with 9/11 survivors adds to research suggesting our brains are not very good at processing radical changes or threats. People on the upper floors of the South Tower had just over 16 minutes before the second airplane hit; those who left survived and those who waited did not. On average, people took 1o minutes to choose. In times of radical change, we need that cunning, adroit part of our ourselves to cut through the illusion that things will right themselves and return to “normal.” It can be a matter of life or death. 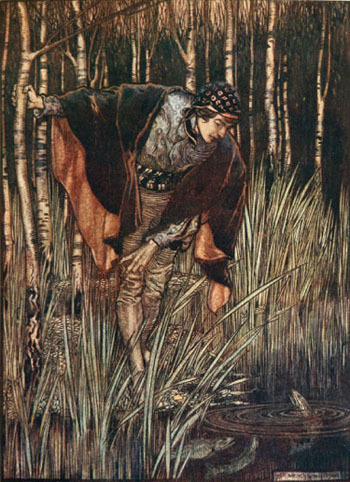 Few things in fairy tales are certain, and the first story in the Grimm’s collection, The Frog King, is an exception that proves the rule proposed by this post. The princess is neither civil nor adroit. She’s a petulant brat, who gets what she wants by hurling the frog against a wall (the kiss only comes in later versions). To our sensibilities, she doesn’t deserve the prince who appears when her act of violence breaks the spell. There’s an irony in the original “Frog King,” however. When the transformed prince reunites with his faithful servant, Heinrich, he almost seems more delighted than he is with his new bride. At least one illustrator, Walter Crane (1845-1915) implies that the princess won’t have everything to her liking. Who does the prince have eyes for in the closing scene, and how does the princess appear to react? Does this story end with a twist that the Brother’s Grimm shied away from? 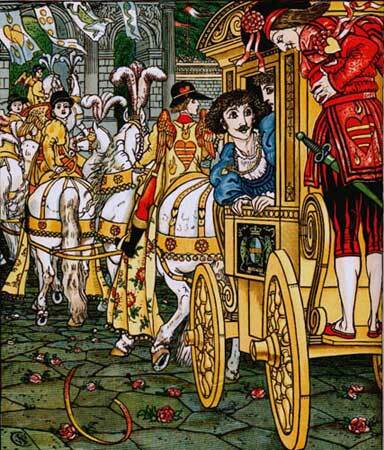 The princess, the prince, and Heinrich in Walter Crane’s 1874 illustration. Experienced explorers warn us that the way through Faerie is perilous. Trails may shift beneath our feet, and hard-and-fast rules don’t apply. As Joseph Campbell observed, everyone must find their own way through the forest. My latest exploration leads me to wonder if “adroit” is another word for “street smarts,” something we need in our own world as well as in dark imaginal forests and castles frozen in time. And isn’t “civil” an attitude that understands that our own wellbeing, even in the most practical terms, must include the welfare of others? The old stories may offer no certain answers, but with careful reading, they can always lead us to ask interesting questions. 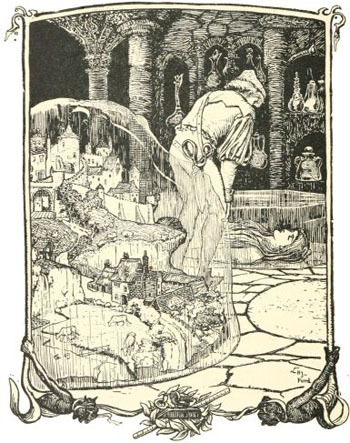 This entry was posted in Article, Fantasy, Folklore, oral tradition, Stories and tagged Article, Fairytales, folklore, imagination, stories, The Brothers Grimm, WPlongform. Bookmark the permalink. I have just checked the etymology of “adroit” and it seems to be connected with “right” and even “law.” Perhaps those successful heroes act according to some law – they know the rules of the universe? Oh, and such beautiful images accompany your post. I would have to think that if law is involved, it’s something like the law of Tao – discerning the right thing to do at the right time. In particular, the “older brothers” are regarded as smart and capable, having mastered conventional wisdom and rules, but it fails them on an unconventional quest. Thanks for reading and your comment. Yes, that is what I thought – some kind of spiritual compass. Thank you for an interesting post. And I just had a flashback to HS French: “a droit” means “to the right.” Presumably a Latin root. The French word for “left” is “gauche,” but that’s post for another day. I wonder too if we look too much to what we call reality as being our guidepost and distance ourselves from the wisdom of fantasy and mythology. The issue of naiveté crops up repeatedly in the “three brother’s” tales. The dwarf tells the youngest son, “Now don’t tell your brothers about the treasures you found,” so what does he do? Or he’ll show an innkeeper his magical table and the latter will swap it for an ordinary table. Robert Bly said such naiveté *demands* a betrayal, and in these stories, the innocent gets a second chance. I’m not quite as sure of the range of stories, but the ones that come to mind of naive vs. street smart girls, especially in the Bluebeard type stories, there are no second chances, although sometimes there are allies (if they’re polite) who warn and help them. In terms of “the wisdom of fantasy and mythology,” for a recent post I re-read Jung’s comments that without any kind of “symbolic” life, the literal world becomes dry and brittle, and I find that true. And because in this latest post I referenced 9/11, another story comes to mind, told by a Christian author and lecturer. He begins his day with contemplation, and such a strong feeling grew in him against traveling on 9/11 that he changed an existing flight reservation. Now he wasn’t on one of the doomed airplanes, but he would have been grounded in another city and missed his appointment anyway. “Maybe some of them did” the writer said, “But perhaps they didn’t heed them.” So yes, I really believe that maturity involves listening to “the still, small voices,” however we understand them. I agree, we are not usually encouraged to pay attention to our intuitions, let alone trust them. On a personal level, perhaps it takes attending to them and accumulating a way to differentiate between which ones are of value and in what way. This takes practice along with the ability to trust that they may have value. Your discussion about Fairy tales reminds me of how much I enjoyed reading them in years past and how they have their own way of teaching. I especially enjoyed the nature wisdom that comes from them in which the characters meet and interact with a variety of animals. I always enjoy your fairy tale analyses. You see things in these stories most don’t I hadn’t read Fitcher’s Bird before and am not too sure I wish I had. Yikes! Some of these stories are a little too Grimm for my taste. I’ve read that in an Italian variant of the story, the adversary is the Devil himself. In various folktales the Devil is shown as something of a buffoon, but not in this case. What’s unique about this story is that the youngest sister has no external allies, but somehow holds enough magic to defeat this dark magician, and overcome his death dealing with her power to restore life. A very strange story.